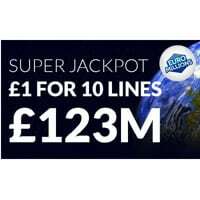 LottoSocial is giving away free a whopping 10 lines for the mega £123M Euromillions Jackpot. On top of that, you will also get the chance to play instant games to win for cash. Follow our link, click Play button and then signup to get your 10 lines for £1 only. Click on “GET IT HERE” button and then follow instructions given above to get this offer.